Central Washington finally experienced several days of typically hot summertime weather during July, with temperatures climbing above 90°F at Prosser seven times during the month. However, a more active storm track than is normal for July worked to periodically deliver cooler Pacific air to the region and provided numerous breaks from the brief hot spells. The region remained cooler than normal, and none of our highlighted weather locations experienced 100 degree weather during July. 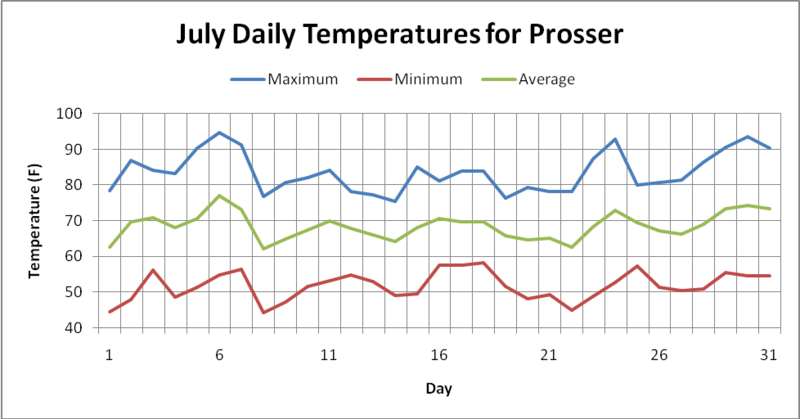 The average temperature during July in Prosser was 68.6°F, which is 3.7°F below average, and the mean daily high and low temperatures were 83.6°F and 51.8°F. The maximum (15 minute) wind speed and gust were 18.15 and 28.91 mph, respectively. Monthly rainfall was typically low, with 0.24 inches falling in about 30 minutes around mid day on Monday the 25th. As often happens during the summer, most of July was completely dry with 96% of the rain falling in 0.03% (15 minutes) of the month. Most of the Pacific cold fronts that crossed the region were associated with uneventful weather systems and provided little more than a westerly breeze and slightly cooler and cleaner maritime air. However, a low pressure system on the 25th led to significant rainfall and isolated thunderstorms for central Washington. Prosser (WSU IAREC) received 0.24 inches of rain on July 25th, including 0.23 inches in 15 minutes (1245pm to 1pm), which was associated with one particularly intense thunderstorm cell. Many central Washington AWN sites received more than 0.2 inches of rain in an hour or less. Chelan and Douglas counties experienced 0.2 to 0.4 inches of rain on Monday the 25th, and there was some concern about water uptake and associated cherry cracking. However, a damage rate of 15% or less occurred in only a few orchards in the region. Windy conditions in the evening combined with relatively cool temperatures for the summer at the time of the rainfall event may have ameliorated the cracking potential. A low pressure system of Pacific origin that produces both significant rainfall and thunderstorms is rare for Central Washington in July. Many weather systems that pass through the region during July are weak and dry. When summertime thunderstorms occasionally occur in central Washington, they are often high based and move in from the south in association with the fringes of the southwestern US monsoon and yield negligible rainfall at the surface. The recent storm system, however, produced many lightning strikes and a soaking rainfall, and originated from a cold core Pacific storm system. Normally, numerous lightning strikes in July would be expected to ignite many wildfires in Washington. However, the rainfall that accompanied much of the lightning, in addition to a cool spring and early summer, somewhat lessened the danger of a wildfire outbreak. A weather system that features instability and cold air aloft is more typical of spring than of mid-summer, and is an unusual occurrence in late July, which is the hottest and driest time of the year. While the Pacific Northwest has generally enjoyed warm but moderate temperatures during July, most of the country has sweltered in oppressive heat since June. July was the warmest month ever in Washington DC, Oklahoma City, OK, and Wichita Falls, TX, according to the National Weather Service. It is not uncommon for the Pacific Northwest to have somewhat different weather than the rest of nation. While a stable and stagnant ridge of high pressure persisted from the Rockies eastward for much of the last two months, causing the Plains and Midwest to swelter in hot and humid conditions, the Northwest has at times enjoyed the cooling influence of the Pacific Ocean, which acts as our natural air conditioner. Once again during July, the warmest temperatures of the month were notably cooler than normal. The warmest temperatures experienced in Eastern Washington in July were in the 90s, while Mt. Vernon failed to reach 80°F. Regional vineyards expect a 15% to 25% reduction in 2011 crop load compared to normal due in part to the late November cold snap last winter and the associated vine damage. Wheat continues to run two weeks behind schedule. The tardiness of many central Washington crops is likely related to the cool spring and early summer conditions. Accumulated 2011 (April 1 to July 31) Growing Degree Days (GDD, Base Temperature 50°F) in central Washington are running behind 2010 values and are well below normal. The 2011 accumulated value of 1106 GDD at Prosser is 376 GDD behind the 5 year (2006 to 2010) average of 1482 GDD. The average temperature at Prosser (WSU IAREC) in July of 1993 (65.4°F) was an incredible 6.9°F below the July normal of 72.3°F. *The following years were excluded from consideration due to missing data: Prosser (WSU IAREC):2002; Gramling (Tri Cities):2005; Moxee:2005, 2003; Mt. Vernon (WSU NWREC):1998, 1996; and Wenatchee (WSU TFREC):2005, 2006.